Hi folks! We're finally back after our month long break! Not that things settled down at all...our house sold, in two weeks (WHAT?! ), and we're knee deep in trying to pack and find new housing. Never a dull moment! Thanks so much for your patience! The challenge ends on Thursday, November 26 at midnight (EST). A random winner will be selected from all of our participants and announced here on the blog on Friday, November 27. You may enter multiple projects, however, your name will only be entered into the drawing once. Each month we will have a sponsor and the sponsor will award the prizes. You must use at least one Wendy Vecchi product in your project. This month, Wendy will be awarding one winner, chosen from a random drawing, a prize package of her wonderful products. The November challenge is to create a project inspired by the fall season. Use some fall colors or themes for this month's challenge. Let's get on with the tutorial! I started by pulling out my brand new Dylusions black page journal...it's dreamy. 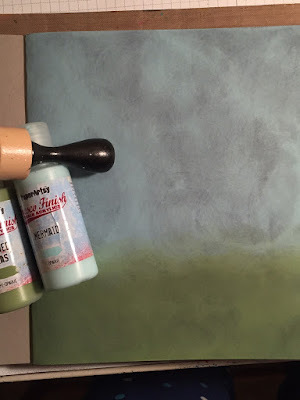 I used a blending tool and two paint colors from PaperArtsy to create a sky and ground on the page. I love how you can just see hints of dark peeking out through the colors. Next, I used Wendy's Add a Stencil stencil and white gesso to add some design to the background. 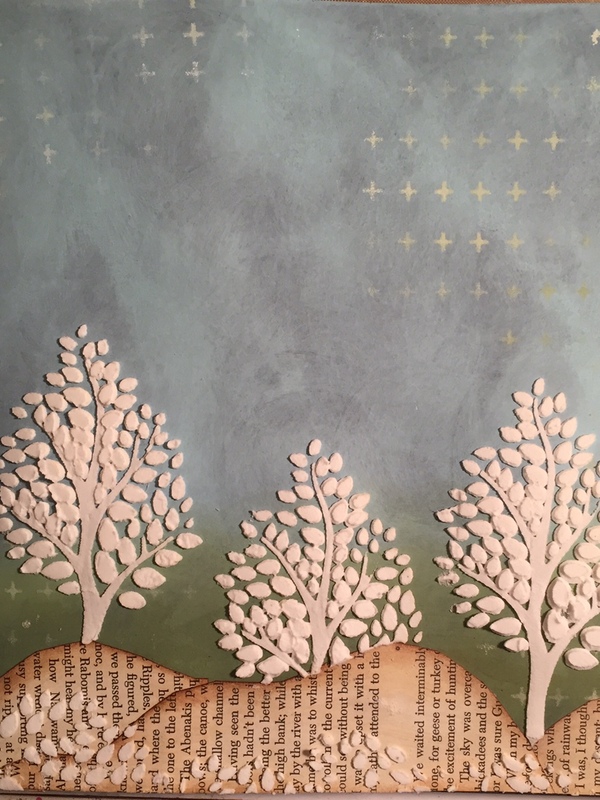 My hills were created using vintage book text and some fancy free hand cutting. I inked the hill edges with Gathered Twigs ink. I used Wendy's embossing paste and the Lovely Tree stencil to add a few trees and to even add some leaves on the ground. This is the step where I forget all about my camera... 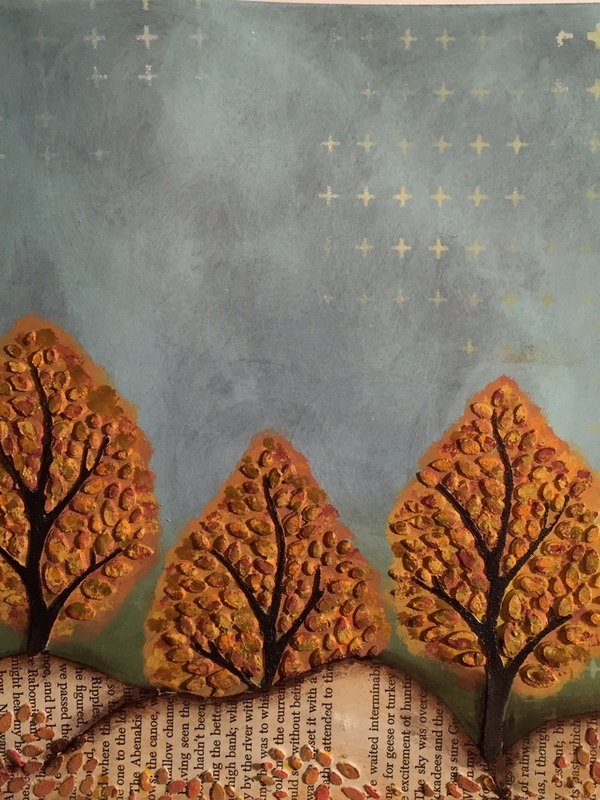 I actually started by coloring the leaves with acrylic paints, but I didn't like the look of the sky peeking through the leaves...the trees didn't look full enough so...I painted in the background of the tree as well, creating a tree shape by hand. Then I added more individiual paint colors to the embossed leaves. TIP - A great trick for easily coloring embossed images is to put the stencil back over the image once the paste is dry. 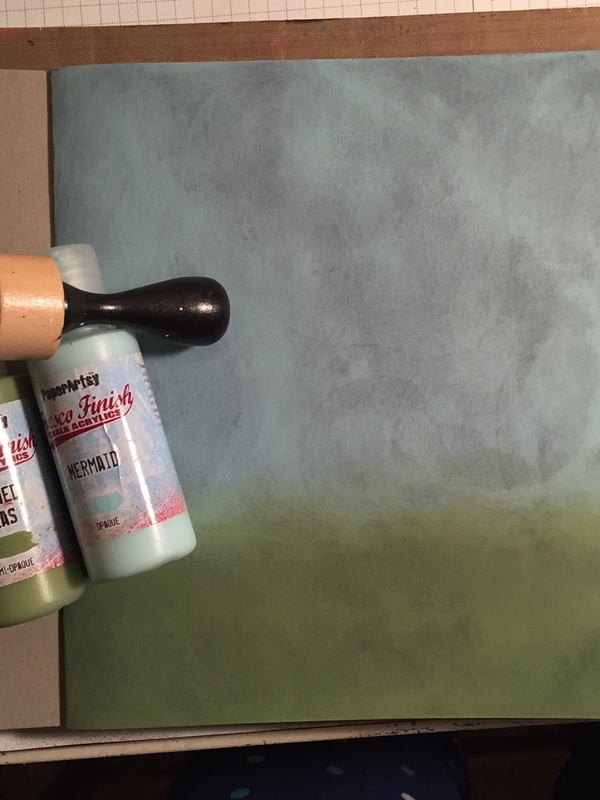 Then you can easily paint individual areas without paint getting on the background. This was the technique I used for coloring the tree trucks. I also used Faber Castell Big Brush markers to create a darker shadow around the hills. Here I added some text throughout the page using Jet Black Archival Ink and the Artful Words stencil. My final step was to add the sun, which I hand cut from designer paper. The sun's rays are from Wendy's Sunburst stencil (one of my all time favorites!). The quote was added using some individual letter stamps. I had a few fall themed stickers in my stash and I added them to the top right hand side of the page, which created the perfect spot for my date stamp. I hope you enjoyed today's project! Now it's your turn! Interested in sharing your ART? We'd love to see what you create based this month's challenge! To share, just add your blog post (the specific post, please) link below. Once your project is listed, you'll be entered into our drawing. Thanks so much for playing along this month! I hope you find a place real soon!! I will wait for the next challenge as I have just moved into my new craft room!! This turned out just lovely - so fall. Loved the tutorial - great inspiration. j. Such gorgeous autumnal colours, love this - great challenge theme too! The linky tool has gone missing from the bottom of your blog post. My entry no longer shows...hope others can add their art! Never mind...it just showed up again. Weird! This is absolutely my favorite!!! I LOVE it! PINNED! You inspired me as well to use the black journal!